"I'm proud to say she's my buttercup, I'm in love, I'm all shook up." We know that’s what runs through your head every time you see an Elvis impersonator or even hear the name, Elvis. We only say that because we know that’s what happens to up! Elvis is the KING. In the world of music there is only one master of Rock and Roll, and that is Elvis Aaron Presley. Since 1953, his music has been played and danced to by teens of all ages. There are very few people who haven’t at the very least heard of Elvis, no matter the age, so you know he’s an iconic part of music that will always be recognizable. 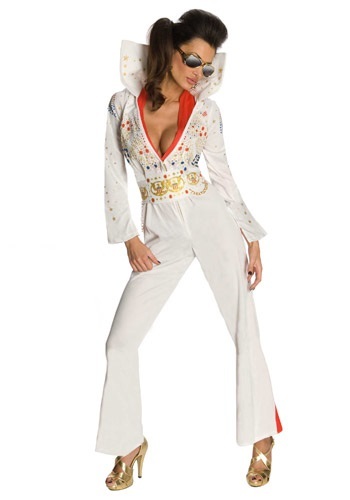 So if you want show a tribute to the king by looking like a queen, this costume is perfect for you! This officially licensed Elvis costume is perfect for Halloween, theme parties, or even for an impersonator. The costume comes with everything you need to transform into the king himself - with a feminine flare, of course! The white jumpsuit has a front zipper for easy on and off all night long and the zipper allows for you to determine how much skin you want to show. The jumpsuit has gold, blue, and red detailing on the sleeves, chest, back, and collar for optimal detail. A white belt with four gold chain links on the bottom is also included. The belt also has gold eagles, American flags, and red dots as accents. To provide a comfortable yet secure fit, the belt closes with Velcro in the back. Get a look that’s red-carpet ready this Halloween!